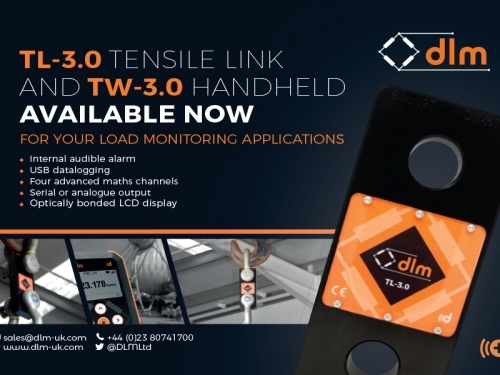 DLM announce the release of the TW-3.0, the new innovative range of wireless electronics unique to DLM. The TW-3.0 is a modern, slim line, multi-functional monitoring unit which is designed to integrate sensors such as load cells, encoders, proximity sensors and more. However, it is not all about the new look and design, DLM have developed and built their own electronics. The electronics are currently the only ones on the market that can offer built in complex features such as advanced maths channels for totalising and use of trigonometric functions, which allows for easy calculation of fixed wrap angles and line tensions. This innovative design is built with the user in mind. It has a large, high quality LCD screen, which is optically bonded and removes the need for a back light and improves clarity in bright sunlight. The TW-3.0 can pair with 12 individual sensors and for ease of use each device on the network can be given a customisable friendly name which is visible on the screen to make instant identification possible. Each handheld device features an internal audible alarm, USB data logging, serial or analogue output and a range spanning more than 800m. The TW-3.0 is specially designed to work well in high noise environments around powerful Wi-Fi networks or port terminals environments. It is designed to limit the effect of large metal objects near-by. The RF protocol utilises bespoke full spectrum frequency hopping, changing channel 20 times per second to ensure your critical reading is displayed. If you are unsure of the best signal location, simply use the built in signal check to find out.